The conference proceedings are published in a two-volume set in Springer's Lecture Notes in Artificial Intelligence (LNAI) series and a volume in Springer's Studies in Computational Intelligence series. Nguyen, N.-T., Attachoo, B., Trawinski, B., Somboonviwat, K. (Eds. ), 640 pages. 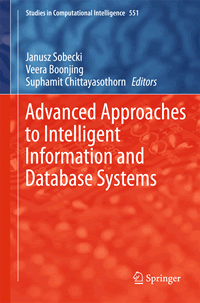 Sobecki, Janusz, Boonjing, Veera, Chittayasothorn, Suphamit (Eds. ), 360 pages.